Light Emitting Diodes (LEDs) are an attractive, economical and convenient option for lighting applications. Available in a wide variety of colors, styles, sizes and intensities, LEDs provide for inexpensive, highly-efficient, low-voltage, reliable lighting solutions. Applications range from lighting in aquariums, recreational vehicles, marine & aircraft to computer case mods, under-vehicle lighting, emergency/security lighting and accent-lighting in the kitchen and around your home - the options are endless. One challenge with LEDs is the mounting of the displays. We produce several innovative solutions, including the LED MR16RGB. 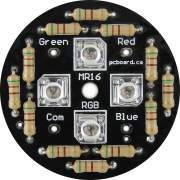 The LED MR16 RGB holds 4 special RGB Piranha / Super Flux LEDs on a compact 1 7/8" (48mm) diameter board. The design allows the board to fit into standard MR16 down light frames (12v 50W halogen frames). The RGB Piranha LEDs are special in that they actually contain three LEDs in one package: a green, red and blue LED. Each LED is controlled separately from the others, with only a common power pin being shared between the units. The configuration allows for a complete rainbow of colors and tones to be created by varying the current to each of the red, green and blue dies (LEDs) in the package. 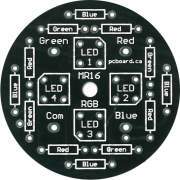 Construction of the LED MR16RGB is extremely simple and can be completed by the novice builder in less than 30 minutes requiring only minimal soldering skills. With only four LEDs and twelve resistors, this system is likely to be one the simplest and most satisfying kits you will ever construct. A complete instruction manual, which includes construction guide and schematics for the LED MR16 RGB is available for download.